...And just like that, summer is over - for me, along with millions of other students. Yesterday was the first day of the fall semester - the first day of my second half of college. Oddly enough, it still hasn't sunk in that I'm an upperclassman, considering how much change I've been through since I started college, and despite the coursework that's been laid out in my English classes so far. It can be safely said that I'm probably going to be facing a lot of self-doubt this semester with all of the writing and reading I have to do, but I've missed being a student after spending the entire summer working full time as a hostess at a sports bar, so I'll probably forgive myself down the road. Every school year, no matter what level of education you find yourself in, is a chance to start over. This blank-slate feeling is not exclusive at all - it applies to anyone. Being in my third year of college, I finally feel like I'm at the place where I belong. Granted it's taken me a long time to get here physically, mentally, and emotionally, but I couldn't be happier that I finally made it. On Sunday I moved into an apartment-style dorm with three other girls - something that I never saw coming, and was initially hesitant about for months. In the weeks leading up to move in-day, I wracked my brain night after night, weighing the pros and cons, my anxiety trying to stop me from seeing any silver linings. I was so worried about what my peers would think - that it's not normal to live in a dorm as an upperclassman - but I was contradicting myself in terms of what I've written before - which is that every college experience is malleable. Who am I, or anyone else for that matter, to determine what makes a "normal" college experience, considering how diverse the circumstances are for every student? There are so many things to take into consideration when it comes to an individual's time spent in school - socioeconomic background, major, ethnicity, interests, et cetera. You can't base college off what you heard from other people, what you see on social media, what you see in movies or television shows (these depictions are often dramatized), or compare your experiences to someone else's. If you do that, how do you expect to be happy? It's difficult throwing yourself back into a hectic schedule after spending months immersed in a different one, but it's possible. 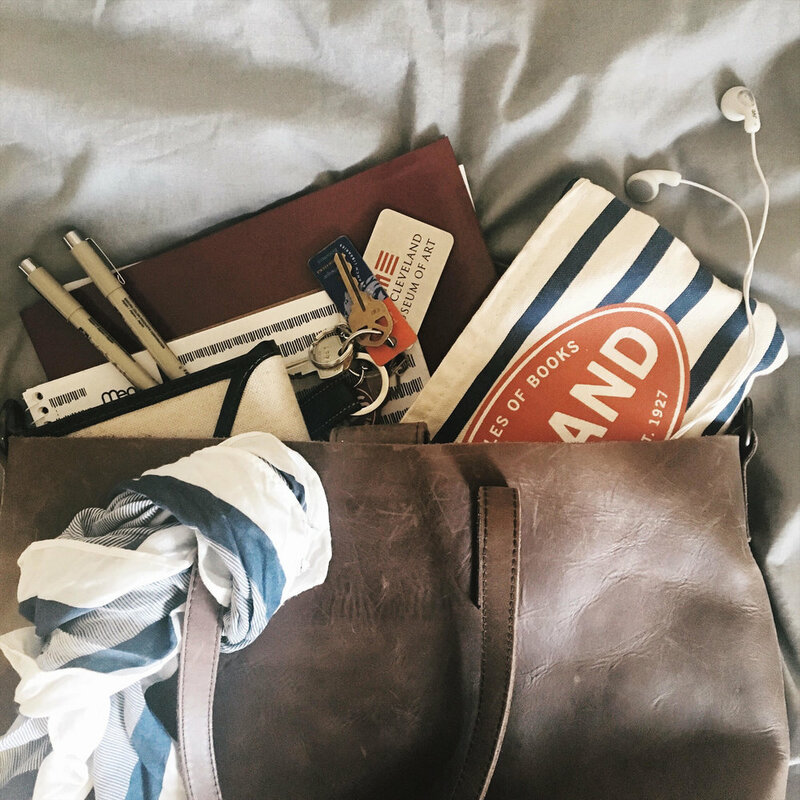 I'm here today to share some advice, along with a few of my school year essentials. Have a good workspace / thinking space - If I have work to do, or need a place to clear my mind with a journal, I make sure that I have a good place to spread myself out. Whether it be a desk, a table at the library, or a nice spot that you stumbled upon at school, make sure you have a place that caters to your productivity - you'd be surprised how much of a difference it makes. Focus on yourself - During the school year, or during any period of time where you have a heavy workload or a lot going on, you have to make yourself your first priority. Keep your head down, get your work done, and don't get stuck on what others are doing, or what others might think of you. Carry yourself in a way that makes you feel comfortable. 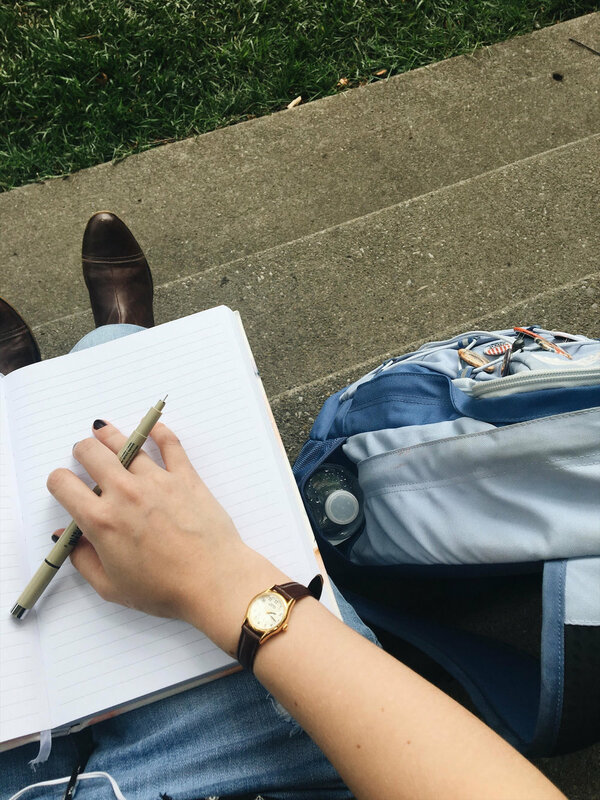 Out with the old, in with the new - The start of a new semester is as good a time as any to drop old habits and replace them with new, more beneficial ones. This semester I would love to cut down on my social media usage - checking Facebook, Snapchat, and Twitter so often within a short time frame is draining and unhealthy, and I can't afford to fall behind in any of my classes given their rigorous assignments. Branch out - If you've always been curious about a subject or a club but never made the time to check it out, do it now - you don't want to let things slip by you just because you're scared of the outcome. Try new things, and see where it takes you. For school, I like to show off my personal style a little bit (see above photo) - especially with my school supplies - I never leave without my planner, a Moleskine cahier notebook, Pigma Micron Pens, and Staedtler Triplus Fineliner pens. What I love most about college is how different everyone is in terms of how they express themselves. A college campus is a celebration of diversity within itself - there are so many different walks of life coming together to study, have fun, and get to know each other. This year, that sense of diversity is amplified since my school is in a more urban setting. On that note, I have homework to do, so I better wrap it up here. I hope you all have a wonderful start to the semester and make the most out of these next few months! Don't forget to step out of your comfort zone a little.